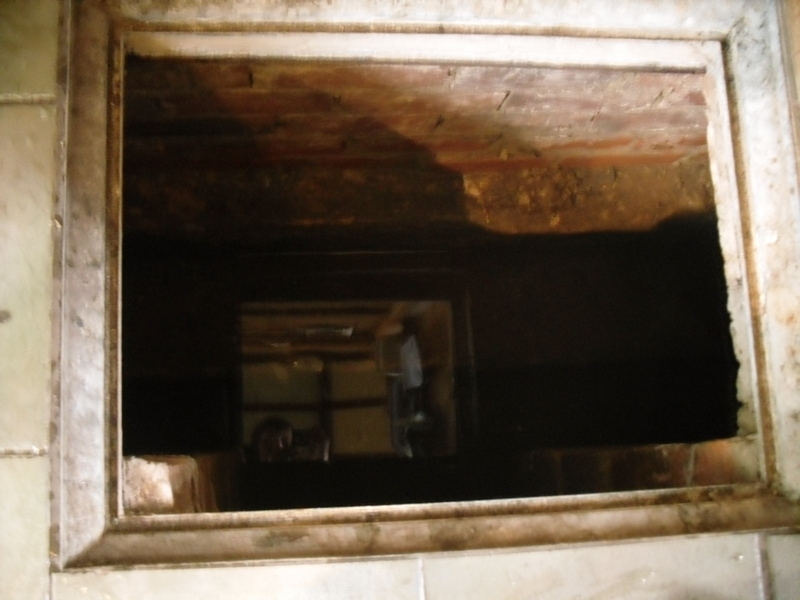 One of the most unusually sited on Nottinghamshire’s holy wells record in Holy Wells and healing springs of Nottinghamshire is St. John’s Well at Welham. I have touched upon this site in my first post on unusual holy well locations and thought it was worth examining in detail. What is interesting about this account is the reference of games and a fair suggesting that if the well itself did not have such a dedication, the saint was celebrated in the locale. This may indicate that indeed the well was so dedicated or that Hutchinson chose this name because of the local fair. Without further information we shall never know. By 1832 White’s Directory notes that it had lost much of its former celebrity. A Robert Walker was a bath keeper at the Well house and may well have been the last one as it appears the well soon fell into terminal decline and I can find nothing is noted of it until 1938. At this time it is noted that its water was still used to provide several cottages in the village. An article written in 1957 states the bathhouse disappeared stating the coming of the railway encouraged people to move away to find more effective spas around the 1830s. It goes on to note that the actual spring location was lost. This I thought was to be the situation, but local investigations not only showed the house to be still existence but the bath still remained! Records show that the estate, was bought by an Arthur Robert Garland of Welham Hall from the deceased estate of John Henry Hutchinson of Clarborough Hall acres117.3.16 along with Well House Cottage and garden for the sum of £3200 on in 1910. 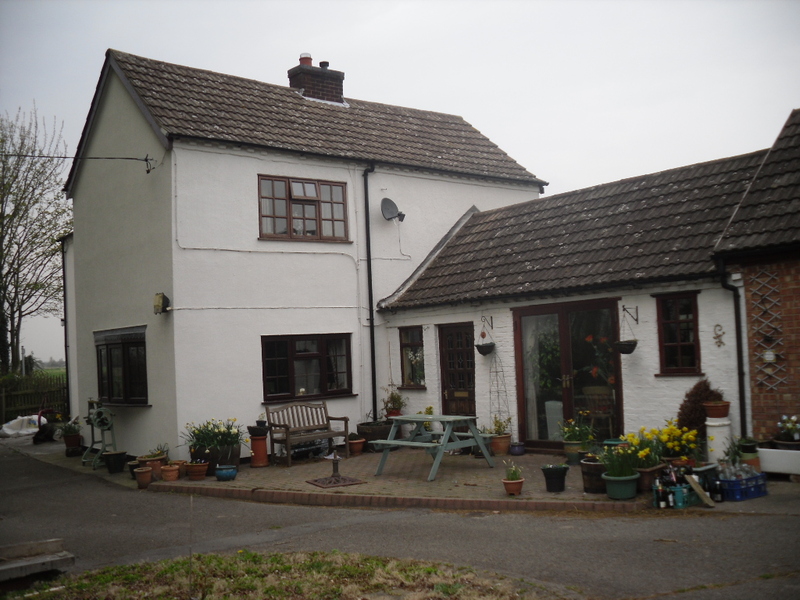 He then sold the cottage and garden to Fred Anderson on 1910 for £130. This was subsequently bought by the late Mr Eric Durham on 1955, later to be purchased by the current owner, Mr Whelan, in 1975.The site is still called Well House. Which although it had been added onto in the last century, its core fabric remains as John Hutchinson built it. The large house being the well keeper’s abode with the side building, now a modern kitchen was the bath house. Arriving at the house, I was at first shown the site by Mr. Whelan the spring which filled the bath which was diverted to the side of the house, the spring itself arising close to the footpath behind the house. 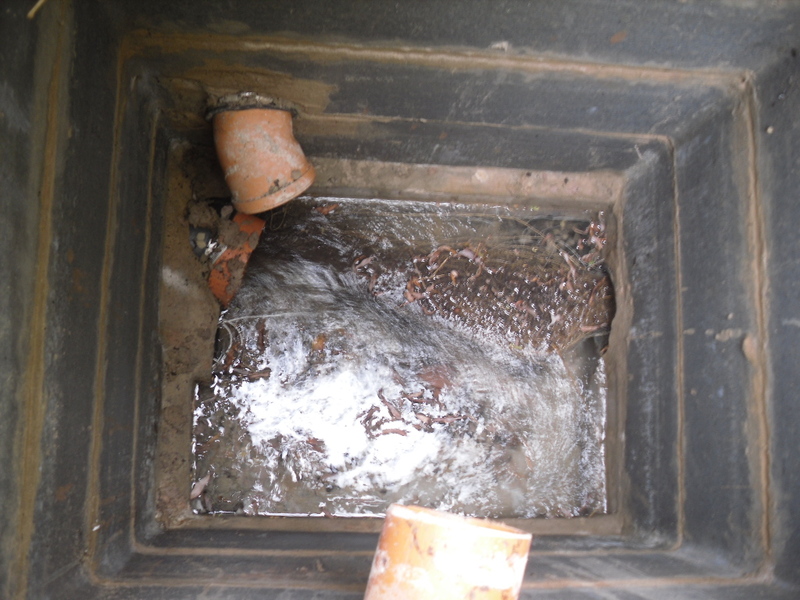 A man-hole cover in the drive way revealed that the spring flows at a fast rate, several gallons per minute. He notes that it had a very high mineral content, soaking through the gypsum in Clarborough hills. He stressed it is drinkable, in small quantities, due to its high magnesium and sulphate (like Andrews Liver Salts). It is quite chalky to taste flat but is very pleasant to drink if aerated. However he did not recommend long term drinking was probably not good for one’s health. 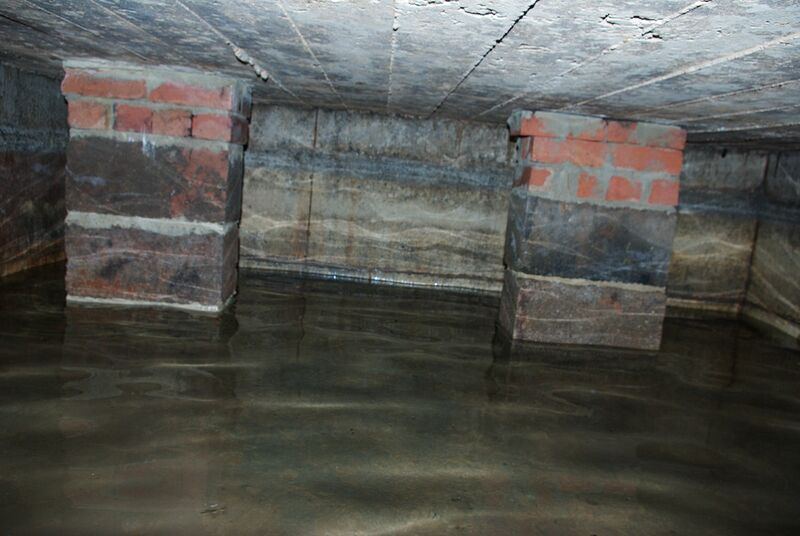 In he kitchen, a small trap door can be removed and beneath the remains of the bath is revealed. This appears to as Mee (1938) describes; a stone basin twelve feet square with a flight of steps entering the water. I scrambled down into this bath and found it presently to have two stone steps which enter the bath, although bricks built upon these suggest that there may have been more. Remarkably the bath still remains enclosing an area fifteen feet by twelve feet, and despite the water being diverted, was full to over a two foot of water. The present kitchen is supported by four brick pillars but this does not appear to have damaged the fabric of the bath which is in fine condition, being made of good quality neat squared stonework. 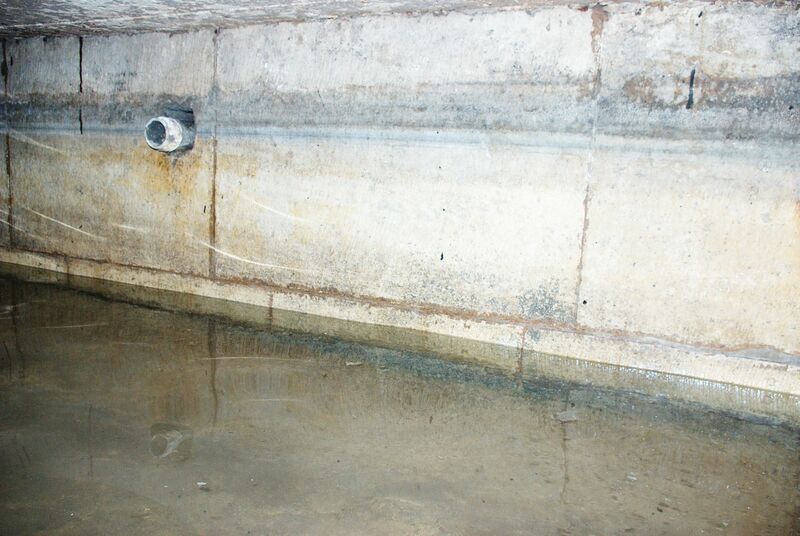 A pipe is found four feet high or so in the wall and a line around it made by the presence of water indicates that the water was of a considerable depth supporting the fact that it was large enough to be a hazard, explaining how Thomas Heald, Vicar of Babworth drowned in it on the 18th June 1759. Mr. Whelan informs me that although the house is not a listed building previous owners had sensibly preserved the bath. Around 30 years ago he was often showing local school children, but it appears now to forgotten. So there it remains a curious relic preserved in its most unusual place. Leicestershire is perhaps not readily associated with medicinal springs or mineral springs but it does have a number of sites including one called once the nobliest spring in England. Roughly speaking there are three main types of springs: Saline, Chalybeate and Sulphurous. Leicestershire had examples of each. Often as at Loddinton’s Eye Well, the impregnation with Epsom salts made it undrinkable and in this case was used for ocular complaints. In other cases, surveys by antiquarians, in particular Nichols (1795-1810) referred to them as medicinal such as at Newton Linford, Shawell’s Shady Well and Ullesthrope Cawdel Well. Chemically many of the springs contained salts, although this did not make them necessarily salty in the general meaning to this although , Nichols (1795-1810) describes a spring at Belvoir as ‘Brackish Well’ and he also refers to a Salt Spring at Donisthorpe. Which he says was used for used against scorbutic disorders, and was visited on summer Sunday mornings. Nichols refers to a salt well at Saddington once used for scrofula and scurvy, but was thought to be useless in point of medicine at the time of his survey perhaps suggesting contamination or the dropping of the water table. Chalybeate springs were more common such as Holwell’s spring, but also at Hinckley where Richardson (1931) notes a Cogg’s Well, at Old Dalby, as well as Neville Holt’s spa. Often in the county the colour of the spring suggests its properties, such as Nevill Holt’s Goldthorpe Spring was said to be curative and at Sapcote the Gold Well was noted a sulphur spring. Here the water was used to cure nervous complaints, consumption, scurvy, eyes. A bath house built in 1806 by a Mr. J. Turner for £600 still stands and is a private house. By 1853 apparently it was little resorted and may have closed soon after, At bath was supposedly to be found at Staunton Harold although very little was left by 1795. These sites hint at the wider establishments set up elsewhere, the true spas. However, only three sites reached what we could consider as a true spa. Such was the fame of the spring that it was called the nobliest spring in the county. Despite this it soon appears to have fallen into decline. 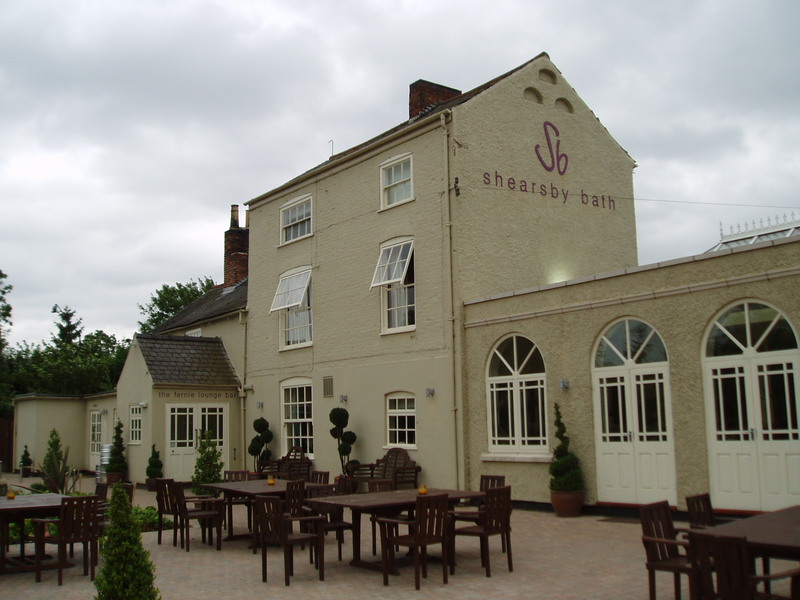 Close by is Shearsby Well, located in a hollow and mentioned by the Leicestershire 18th century historian, John Nichols. This was converted into a spa and became renowned as a famous salt spring. Bath hotel remains and supposedly one can bath in its waters in the cellar but I have failed to have this confirmed. Hinckley’s mineral spring, whose water was said to resemble Harrogate, Tunbridge, Buxton and Carlsbad, were developed into baths in the 1830s with the opening of the Mineral Baths hotel and its pleasure grounds in 1849 for bathing and drinking of its waters. The main bath being 20 feet by 60 feet. The outlay never met the profit and in 1892 or thereabouts the baths were demolished and the New Mineral Bath’s Hotel built on the site. The waters have vanished but the pub remains. 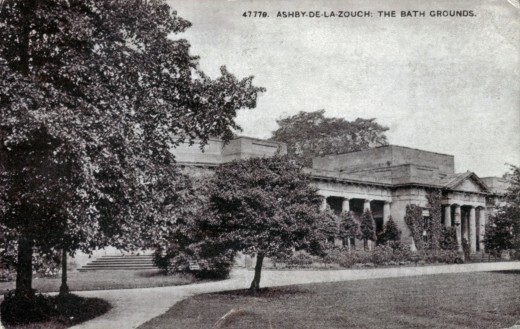 But the most famous was Ashby de la Zouch’s spa. This was a prospected spring so to speak, having arisen as a result of colliery work at Moira in 1801, water being struck some 700 feet below the surface. Its waters were said to be good for skin diseases, scrofula. First the water was transported in carts or boats to the town. However, the first Marquis of Hastings realising the commerciality of the waters set about developing a proper spa, with hotels, theatre, elegant terraces and a bath house. The bath house was completed in 1822 and named Ivanhoe baths after the association of the Sir Water Scott’s book with the nearby castle. Six baths were established in the Doric portico temple spa and the waters were recommended for gout and ‘full neck, nerve-ache, green sickness and ringworm’ However, it was too late a spa and could not compete with established spas and the growing trend for maritime spas. The springs of which were on the borders with Derbyshire and now fill ponds at the Conkers activity centre where there is a small information board about it. The famed baths were destroyed in the early 1970s. This was the last attempt at undertaken to develop mineral springs in the county. Dorset is a rich county for holy well and healing spring explorers, many years ago I did some field work there. These are some of my notes. “After venerating the shrine, our pilgrim made his way to the saint’s well, about a mile away at Morcombelake. The waters of St. Wite’s Well enjoyed a reputation as late as the 1930’s as being “a sovereign cure for sore eyes”. They were said to be most efficacious when the sun’s first rays lit upon them. Sore eyes, were of course, a constant source of discomfort to medieval man, living as he did in low cottages from which the smoke did not escape properly. Lead holy water bottles or “ampullae” were filled here and taken home for later applications. It flows into what is possibly one of the smallest stone basins I have ever seen for a springhead and it is not surprising that it was lost for many years! The survival of the site is secured as this one of the few holy wells on National Trust land. Little appears to be known of this well but its name is significant deriving as it does from probably from a hermit long forgotten who probably used the spring. It is known that Augustian Friars established a community here in the 14th century. One assumes the well is dedicated to Our Lady as the church is called St Mary’s. It is interesting that a local place was called Remedy on the old maps. The well fills a stone chamber by the edge of the wood above the church. 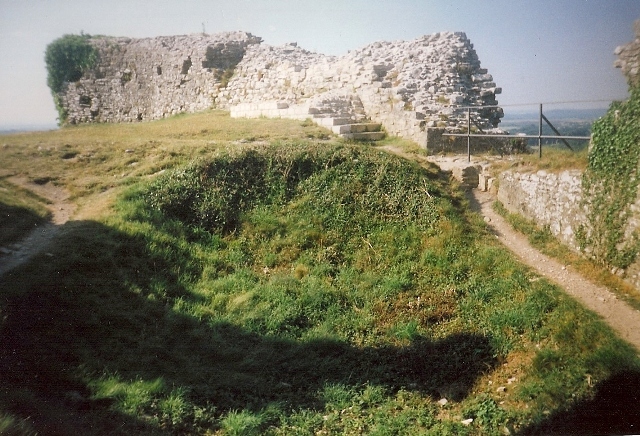 One cannot fail to miss the grand ruins of this mighty fortess, now despite being broken and breached its very position as a sentinel to the picturesque Corfe it remains the iconic and impressive place. What is easier to miss and less well known is the well which lies within the ruins. The story tells that here the body of the Saxon boy king who reigned from 975, after the death of his father Edgar. Although he was the eldest he was not officially recognised and this issue appears to have precipitated his demise, being thrown down this well in 978. Who planned the murder is unclear, history has always accused the mother of Ethelred the Unready, Aelfhryth Edward’s step mother, as she had more to gain. When the deed was revealed, by a pillar of fire from heaven, and the body retrieved it was found to be incorruptible and was enshrined with great grandeur first at Wareham and then at nearby Shaftesbury Abbey. The water thereafter was thought to be curative and was particularly good for eye complaints and the ague. When I visited there was no sign of water and all there was to mark it was a depression. Whether this is the exact well or not is of course unclear the date of the indeed long predates the ruins. It is possible that the story hides some pagan motif and so is its similarity to that of St. Kenelem is interesting. It is interesting to note that the church also dedicated to the saint had a well dressing ceremony in 2008.